Obachan's Kitchen & Balcony Garden: I'm Back!! Yes, I came back to my room around noon today and found sooooo many comments from all over the world waiting for me on this blog! Thank you, everyone. There's a lot to tell you, but for now I just want to say that everything went fine. P.S. Here is a photo that shows one of the things I did on the day after the surgery. Welcome back Obachan and really glad to know your surgery went well!! Do take your time to recuperate and always looking forward to reading your blog again!! This flower basket is wonderful! I'm glad to hear that everything went A ok! Rest and take care, ok? Happy to see you are home. Take it easy for a while. 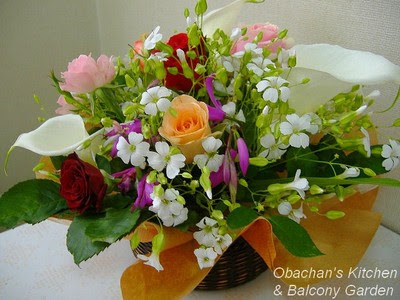 take care Obachan please have a speedy yet relaxing recovery. Glad you're back Obachan! May you get well soon and hoping to hear about your adventures in the hospital! Good to hear you're back and everything went fine... enjoy some rest and regain strength! Welcome back , Obachan ! Take care. Hey, welcome back, I'm glad you are doing well! Welcome back, glad everything went well. Wishing you a speedy recovery. I'm very glad you are back and making a speedy recovery. Your blog is great and we really enjoy reading it. Hi Obachan, I didn't visit your site for a few weeks and only learnt about your operation today. Welcome back! Happy to hear that you're back! Dear Obachan, I'm so happy to hear all went well and looking forward to hearing all about it. I just know you will make a stay in the hospital sound like a fun adventure! Beautiful flowers. Nice boss. I glad you are back and well! Welcome back! I nominate you as Kochi city's ambassador. You've done much for this quaint and laidback city of yours that I want to visit it! Back as perfect form again? Thats alright to slow down awhile.We can wait for you to pick up speed.Give yourself time to recuperate and reenergise. Dear Obachan, Sorry to hear of your travails but looks like alls well that ends well, you have my wishes for a speedy recovery. Welcome back dear Obachan! Glad to know that you are fine now. Best wishes to you and hope you recover really really soon! muackz~ I miss your delicious food blog so so so so much! I'm happy to hear that nothing went bad, and that you're back to tell us a little more about you and about your wonderful country for a long time from now on! So, Welcome back Obachan! Dear Obachan, I am glad you are back! I hope you feel better after your medical procedure. Now you can blog about hospital food. I think the painting was made with tea and water. Am I right? glad everything went well. take things easy yah. Welcome back, obachan! I'm so glad to hear that you're doing well. Thanks for blessing this corner of the web with your presence, and make sure you get enough rest to make a full recovery! Really glad to know that your surgery was a success! : ) I’m sure you are recuperating well… Take all the time you need to rest and recover, ok? Sorry I'm not responding to each comment, but I truly appreciate your kindness. Hi Obachan, I'm glad to hear that your surgery went well. I enjoyed reading your posts on hospital food. lol! only a food blogger :) hehe! Thanks for coming by. I'm interested in American hospital food, too, but I hope you don't have a chance to report on it.